Jean-Paul Sartre seems to have attempted at times to go beyond mere existentialism in an effort to achieve a sort of eternal salvation through the literary creation of a life which transcends physical reality. Put differently, Sartre saw a redeeming power in human words–a solace, a transcendence, and a remedy to ordinary existence in literature, especially fiction. Insofar as he adhered to this view, he divinized words, replacing the Word. Sartre’s problem, of course, has intriguing echoes in an age of mass media which thrives more on propaganda than on information. In any case, Maura A. Daly focuses precisely on Sartre’s divinization of human words in the article which follows, and shows that even for Sartre the experiment does not work. 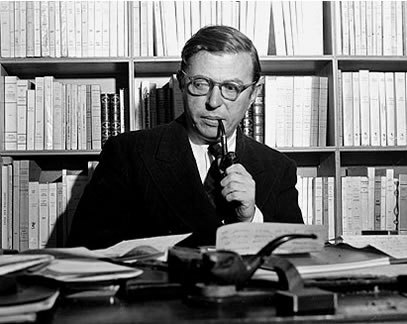 Nowhere in twentieth-century literature is the dichotomy between secularism and Christianity more apparent than in the writings of Jean-Paul Sartre. Paradoxically, however, the secular beliefs expressed in many of Sartre’s works pattern themselves almost exclusively on the Christian mode. Perhaps this tendency is best exemplified in Sartre’s literary autobiography, Les Mots (Words) which was published in 1964.